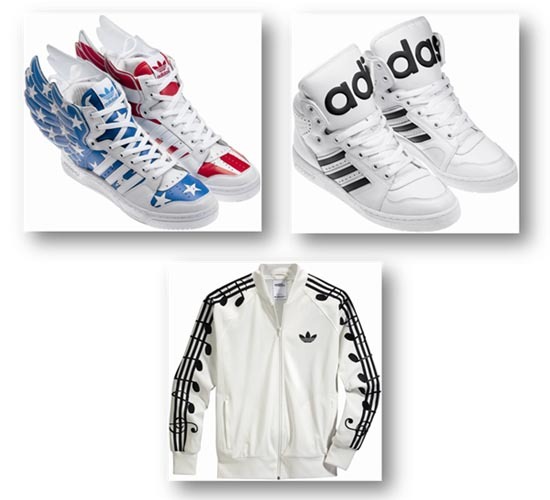 LOS ANGELES, Mar 7, 2012/ — After the highly successful “Meet Jeremy Scott at adidas Originals at SoHo, the sports label is once again hosting in-store event with Jeremy Scott, this time at its Los Angeles outpost. 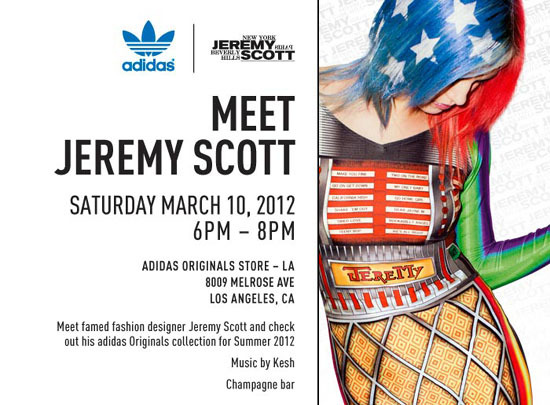 This Saturday, March 10 at the adidas Originals store at 8009 Melrose Avenue, guests are invited to meet famed designer Jeremy Scott and check out his spring 2012 adidas Originals collection from 6:00 p.m. to 8:00 pm. Music will be provided by Kesh and guests can raise a glass to Jeremy at the champagne bar. New drops including the JS Wings 2.0, Instinct Hi and Music Notes Track Top will be at the store for purchase. When: Saturday, March 10 from 6:00 p.m. to 8:00 p.m.